Check out this new race for the world setting of Cyrus created by Tim Hornikel. 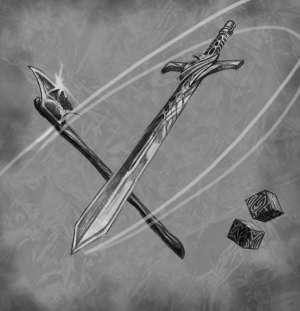 Animated Objects are normal weapons and objects of metal that are powered by the souls of murdered slaves of the Godelves. Despite already wielding phenomenal magical power, the Godelves of Cyrus had always been fascinated with ways to increase their ability to wage war and subjugate the world. To that end they carried out many profane experiments. One of those experiments resulted in the creation of weapons and objects animated by the souls of murdered slaves. This title was added to our catalog on October 30, 2011.